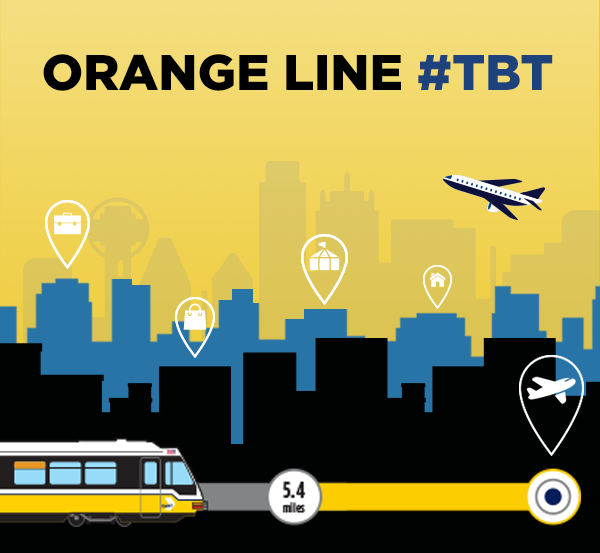 The decision to build the Orange Line was finalized in 2000 after the DART Board approved a preferred route for the line and changed it from commuter rail to a longer light rail route that would directly serve DFW Airport. A few months later, a successful bond election solidified funding for the project. Working closely with the City of Irving, DART refined the line to run directly through Irving and serve the University of Dallas, North Lake College, and Las Colinas before ending at DFW Airport. The Orange Line opened access to critical parts of North Texas, including educational institutions and new mixed-use developments. It also provided a key connection to another form of transportation—air travel. After the Orange Line opened, the DFW Airport became the third-largest American airport with a direct rail connection to the heart of North Texas. The first phase of the Orange Line debuted a 5.4 mile section from Bachman Station to the Irving Convention Center Station. In 2014, the Orange Line finished construction with a connection to the DFW Airport. To inaugurate the new line, then-Governor Rick Perry, shared some congratulatory remarks for DART and North Texas. How do North Texans Use the Orange Line? After the Orange Line opened, Irving residents had new mobility options to the rest of the region, including downtown Dallas. Vice versa, now North Texans could easily access and experience all that Irving has to offer for arts, education, entertainment, and business! The University of Dallas, Las Colinas Urban Center, and Irving Convention Center are just three of the great destinations along this new route. When Irving and DART collaborated to bring the Orange Line to this new area of North Texas, it brought not only increased mobility, but spurred development as well. In fact, construction of luxury apartment communities and additional mixed-use development in the Las Colinas Urban Center increased after construction of the Orange Line was announced. The benefits of access to transit are paying off even today. Las Colinas continues to attract new businesses looking to relocate thanks in part to access to transit and the Orange Line. Can you imagine how out-of-towners and professionals would travel to and from DFW, how college students would get to their first internships across the area, or how commuters would make it to their places of employment without battling traffic? We can’t either. At DART, we know that a new transit project brings so much more than mobility to a community, it brings a new and better way of life.